Fleece fabric is the ultimate fabric for beginning plush artists. It's cheap, widely available, and easy to work with, while still being snuggly and warm. It's meant to imitate wool, but without the price tag, difficulty in washing, or itchy feeling common with wools. Because it is so cheap and widely available, I find it is often misunderstood. Learning a bit more about this versatile fabric can help keep your sewing projects looking and feeling high quality! Some of the confusion around fleece stems from the variety of fleece on the market all sold under the name, "Fleece". Adding to the chaos is the fact that different companies may use different names depending on a variety of factors. To understand the reason behind the variety, you have to look at the history of fleece. The original fleece was created by Malden Mills, now known as Polartec. The CEO of the company at the time declined to patent fleece which allowed other companies to copy the technique. Because fleece was such an attractive alternative to wool, it exploded in popularity and companies were quick to take advantage of the demand. These factors combined to bring us the wide variety, low price, and high availability we have today. Another essential element of understanding fleece is understanding how it is created. To start, plastic is spun into yarn. This yarn is then knit into fabric with tons of tiny loops. The loops are brushed, which breaks them down, while also causing the fabric to puff up and become thicker. Finally, the fibers are shaved down to an even length. You can watch a really cool video detailing the process below. As you can see in the video, brushes add the finish to the fabric. This is especially important to understand as variations in this process is what creates all the different variations we have in fleece today. Generally fleece fabrics for sewing and crafts are single sided, meaning that beyond the intial brushing, they are only treated for pilling, etc, on only one side of the fabric. This keeps the cost low. Fleeces meant to be worn are usually double sided. That is why your fleece pullover is much thicker and feels the same on both sides compared to fleece blankets or plushies. The most common fleece has what's known as a "brushed finish." Brushed finish fleece has, as the name implies, only been brushed to break apart the fabric loops. No additional steps for increased thickness or reducing pilling were taken. Which makes this type of fleece cheap to produce as it's the least time intensive to create. This type of fleece has a smooth feel to it. Printing is visible on both sides, but designs will be slightly crisper and brighter on the "right side" of the fabric. Common names for this type of fleece are brushed fleece, regular fleece, blizzard fleece, glacier fleece, or polar fleece. The name polar fleece is actually a trademark name for fleece from Polartec. Do not confuse Polartec with polar fleece. One is a brand while the other is a style of fleece. Polartec brand fleece is regarded as the highest quality fleece available while polar fleece or brushed fleece is often the lowest quality fleece available. The low price tag and smooth finish of brushed fleece can be appealing, but this fabric is known to pill. Pills are those little balls that form on fabric over time and must be shaved off to keep the fabric looking nice. Brushed finish fleece is wonderful if you want a smooth texture, but not so good if you want your plush to stay looking like new as long as possible. The low cost makes it excellent for prototypes or experimentation. Which leads us to the second most common fleece fabric: Anti-pill finished fleece. Known simply as anti-pill fleece, it has gone through the secondary process of shearing to reduce the chance it will pill. Which is not to say anti-pill fleece will never pill, it is just less likely to. This fleece will have a rougher finish on one side. This can appear as a bumpy or furry texture. Generally, antipill fleece is single sided, meaning the anti-pill process has only been applied to one side of the fabric. The other is the same as brushed fleece and will pill. Printing will be much more noticeably crisper and brighter on the "right side" of the fabric. Anti-pill fleece is a nice middle ground fleece. It is usually only a few dollars more than brushed fleece, but it will stay looking nice longer. 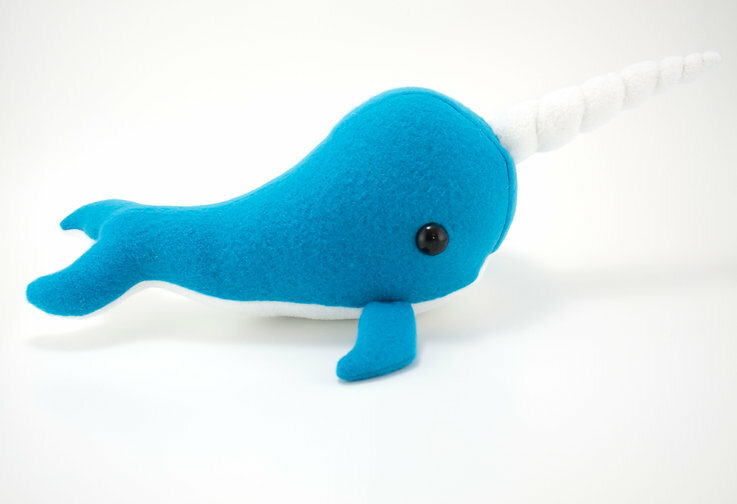 This narwhal is made of fleece with a brushed finish. You can see it has a smoother surface. 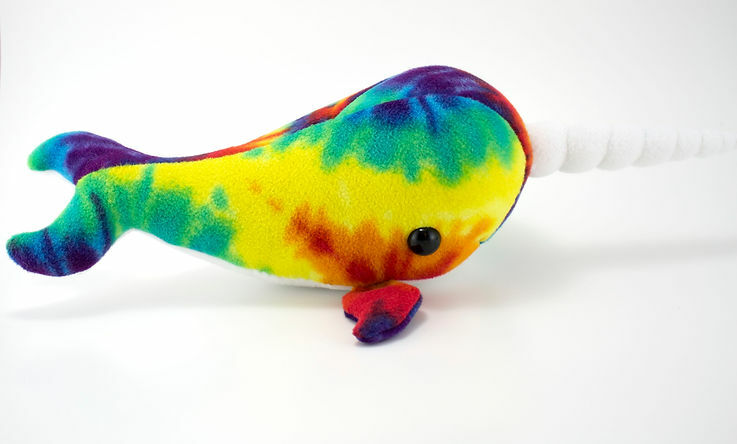 This narwhal, on the other hand, is made from anti-pill fleece. You can see it has a bumpy, rough looking texture. This narwhal, too, was made from anti-pill fleece. 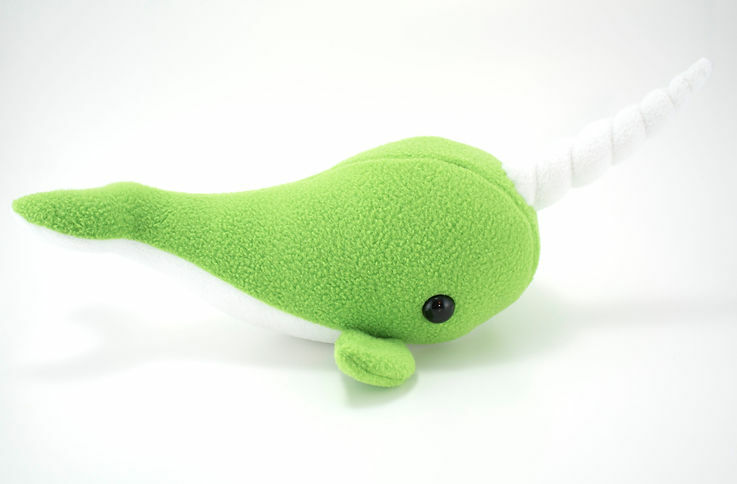 If you look closely though (this one is difficult to see because of the pattern of the fabric), you'll notice that this fabric is not as noticably textured as the lime green narwhal. That's because this narwhal is made from what is known as microfleece. Microfleece goes through the full process of brushing and shearing on one side similar to antipill fleece, though some brushed finish microfleece can be found. The difference is that microfleece is made with tiny microfiber yarn. It is generally thinner and softer than most other types of fleece, but also comes with a higher price tag. Due to the thin size, it is generally also stretchier and prone to curling on the edges. It makes it a bit harder to sew. Iron on interfacing can help reduce the stretch. Often, the feel of this fabric called buttery or silky, it's definitely a treat to the touch. Microfleece will produce some of the softest and highest quality fleece plushies. If the higher price and difficulty isn't a deal breaker for you, I high suggest using microfleece. Other names for this material are microchamois, suedecloth, and buttersuede. Some confusion arises in the use of the term microchamois. Microchamois is the finish given to the fabric (remember, the finish comes from the method used to brush it), but microfleece is the name given to the fabric made from the micro yarn. Microfleece is commonly confused with microfiber terrycloth, which is an absorbant and thin type of cloth used for wash clothes. It is also confused with a chamois, or cleaning shammy, used for cleaning cars as these are a traditionally a type of leather. These are just the most common types of fleece you will find. There are many other types of fleece and fleece-like polyester fabrics out there. Armed with this knowledge, you should be able to walk in most craft stores and navigate your way through their confusing terminology to find what you really want. Get used to feeling fleece fabric so you know what each type is by touch, regardless of the name it's given. That way you won't be confused when a store decides to rename their fleece to another word for polar. You can also see my quick review of my Mill Yardage (Malden Mills/Polartec) swatch pack over on tumblr with pictures and descriptions of some of the fabrics I think are particularly notable. If you'd like to see and feel them all for yourself, I highly recommend a swatch pack of your own here! Ann Andrews, For durability I’d recommend anti-pill fleece. If this is a blanket you don’t intend to last for a long time, Joann’s anti-pill is thick and soft. But if you intend this to be a keepsake that will last awhile I’d suggest looking into authentic polartec for maximum durability. (https://www.millyardage.com/Default.asp) It’s not the cheapest, but it will stand up well. 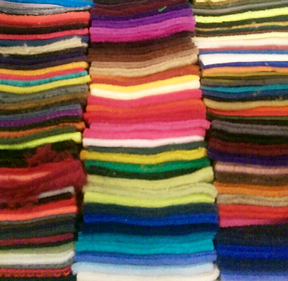 I am preparing to make a T-shirt quilt. I thought fleece on the back side of the quilt would feel great. It is for a boy going to college. Which fleece would you suggest?